Aaron and I set up The Playground in December 2014. The Playground is actually an expansion of Queenstown Paintball which we bought in August 2011. 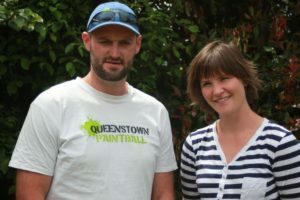 Aaron and I moved to Queenstown from Dunedin at the end of 2002. Aaron is an Otago boy born and breed, where I am a Hawkes Bay girl but Central Otago is now home. Aaron moved here as a chef but worked as a courier for the last 6 years, In 2011 he started his own business as The Stand in Man. He relief drives and fills in for anyone that needs time off, everyone from the milkman to tourism operators. He continues to do this as well as run The Playground. I am a massage therapist, and have a massage business called Spiraling Elements, mainly working with locals. Up until October 2010 when we had our 1st son Angus my business was full time. Now, I massage in the evenings working around Angus and our other son Benji as well as behind the scene’s administration of The Playground. The Playground was set up to offer multiple, affordable, high quality activities in one location. We wanted something for the local Queenstowners. We are excited about the potential The Playground holds.